We're more than just bubbles. We're happiness. We're togetherness. We're moments that last a lifetime. Experience Gazillion Bubbles. 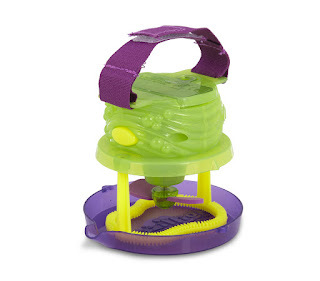 This special machine and specially formulated bubble solution produce bigger bubbles than ever before in seconds. Simply pour Giant Gazillion Bubble Solution into the reservoir, push the button, and watch in amazement as the wheel turns and blows truly GIANT bubbles into the air! The Giant Bubble Mill includes an 8 oz bottle of non-toxic Giant Gazillion Bubble Solution. 3 AA batteries required, not included. Appropriate for ages 3 years and up. Create GIANT bubbles with the Gazillion Bubbles Incredibubble Wand! 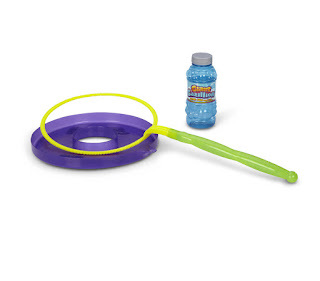 Dip the wand into the specially formulated GIANT bubble solution and wave to make massive incredibubbles! This large wand comes with its own tray and 16 ounce bottle of Giant Gazillion Bubble solution specially formulated to create huge bubbles. Simply pour the solution into the provided tray, dip the wand into the solution, and give it a wave to create incredibubbles! Appropriate for ages 3 years and up. Create massive bubbles at the push of a button with the Giant Gazillion Palm Bubble Juggler! This special device and specially formulated bubble solution produce bigger bubbles than ever before. 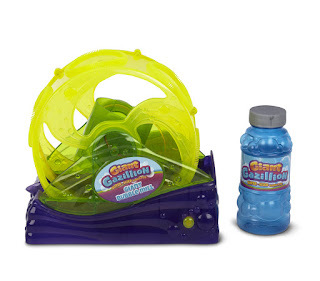 Simply pour Giant Gazillion Bubble Solution into the provided tray, strap the Palm Bubble Juggler to your hand, dip the wand into the solution, and push the button to blow truly GIANT bubbles that you can make hover with the fan! The Palm Bubble Juggler includes a 4 oz bottle of non-toxic Giant Gazillion Bubble Solution. 2 AAA batteries required, not included. Appropriate for ages 3 years and up. Giant Gazillion Bubble Solution has been formulated to create bigger bubbles than ever before! This extra-special solution was crafted in a lab to create bigger, more elastic bubbles than any other formula so you can create truly GIANT bubbles. 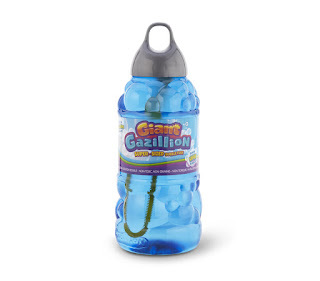 Each 2 Liter bottle of Giant Gazillion Bubble Solution comes with a specially designed bubble wand and works with any Giant Gazillion Bubbles product. This premium solution is eco-friendly, safe, non-toxic, and will not stain clothing or furniture. With Giant Gazillion Bubbles, you’ll run out of breath before you run out of bubbles! Appropriate for ages 3 years and up. Create family moments that last a lifetime with Giant Gazillion Bubbles®! Giant Gazillion Bubbles are an absolute blast and my kiddos were absolutely in awe of how big the bubbles were. The Giant Gazillion Bubble Mill put out tons of bubbles and my kids enjoyed running through them over and over again. My daughter has a birthday party coming up and I definitely plan on using the Giant Gazillion Bubble Mill to add a little extra fun to the party. The Giant Gazillion Incredibubble Wand is also a hoot and allows kids to make some super ginormous bubbles. Even my 2 year old was able to make some ginormous bubbles so it's incredibly easy to use. 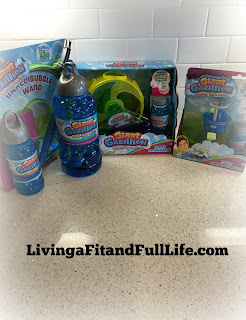 Another Giant Gazillion Bubbles product that my kids absolutely love is the Giant Gazillion Palm Bubble Juggler! It makes large bubbles with the touch of a button and then kids can use the fan to make the bubbles hover in the air. Giant Gazillion 2 Liter Solution is a must have when having this much bubble fun and I have to say, as a mom of four who's used a lot of bubble solutions in the past this solution makes making bubbles incredibly easy. We rarely had a failed bubble and the bubble solution seemed to be top quality. Giant Gazillion Bubbles has everything you need to create some amazing family memories this summer and beyond! Available at Walmart, Target Amazon and ToysRus! Click HERE to learn more about Giant Gazillion Bubbles! Follow Giant Gazillion Bubbles on social media!